The officer who killed an Iraqi journalist at a Baghdad checkpoint in March was sentenced to life imprisonment on Sunday, a spokesman for the judiciary said. 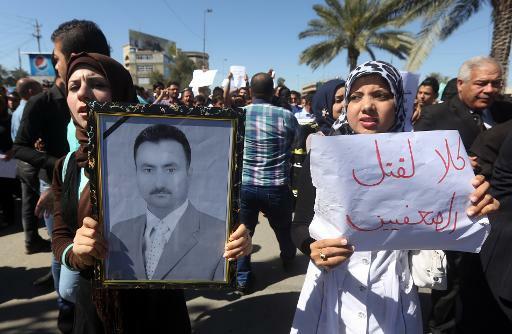 “The central criminal court of Iraq, headed by Judge Beligh Hamdi, handed a sentence of life imprisonment to the defendant, who was accused of murdering journalist Mohammed Bidaiwi,” Abdelsattar Bayraqdar said. “The court found that the evidence collected over the course of the trial was sufficient to convict the defendant,” he said. Bidaiwi was on his way to work on March 22 near the presidential complex on the edge of the heavily-fortified Green Zone when he was shot dead during a heated argument. According to witnesses, Bidaiwi was shot at close range by a plainclothes officer in the Kurdish peshmerga force. The trial had marked a rare instance in Iraq where the murder of a journalist has been taken to court. Bidaiwi had been bureau chief for US-funded Radio Free Iraq since 2006 and was also an associate professor of journalism at Baghdad’s Mustansiriyah University. The station was established in 1998 and is a branch of US-funded Radio Free Europe/Radio Liberty, broadcasting in Arabic from Prague and Baghdad. Iraq remains one of the world’s deadliest countries for journalists and is routinely criticised for its poor record on media rights.